What? Honestly, I read your blog because I design book covers for a living and like to hear what people are saying about my craft. Generally I disagree with your critiques of the jackets you feature. I can tell you're not a designer by what you say. I generally don't like to speak up about it, but I have to call you on your insane thoughts about this cover. It's beautiful, well designed, well balanced and different for a horror novel by a huge commercial writer. This is one of my favorite jackets of the year. I'd probably go for a slightly more weather-worn grungy look, actually. To anon 9:58 - "huge commercial writer"? Come on, that guy hasn't published in twelve years (I actually liked A Simple Plan and am looking forward to this one). 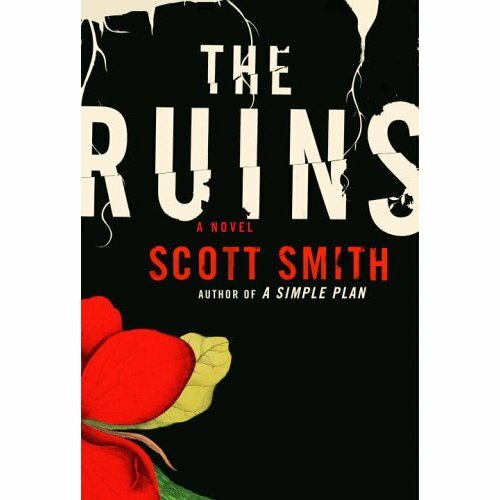 As for the cover: Typo is great, especially the cut in "Ruins" - brings the point over, b/w is cool - but the flower in the lower left kills it for me. It makes it so damn obvious. I love this cover. It has that 1940's feel to it, but doesn't rely to heavily on being nostaligic. Nice use of type. I don't think it is too predictable. I wish I had designed it. i don't mind the feel of it at all, but i look and it and think, "man, my eye has no idea where i'm supposed to start."